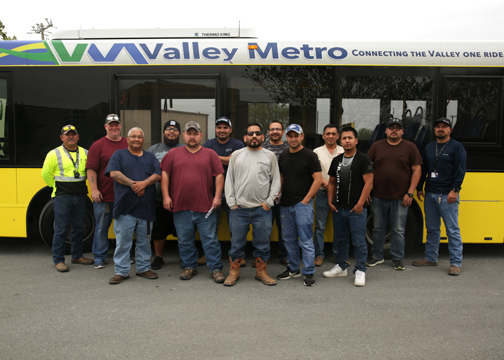 Texas State Technical College, in partnership with Valley Metro, recently began a Professional Bus Driver Training course to help fill a regional need. As an offering via Workforce Training and Continuing Education, students receive preparatory training for both written and driving exams for bus driving. The first class began the 80-hour, two-week course on March 5. Throughout this time, they will receive hands-on training thanks to a bus donation from Valley Metro. Those who complete the course and pass all exams will earn a Class B license. The license is awarded through the Texas Department of Motor Vehicles. Graduates can then work as drivers for transit systems. These include Valley Metro and Metro McAllen as well as Brownsville Metro and Greyhound Lines. Lower Rio Grande Valley Development Council Valley Metro Director of Regional Transit Tom Logan said the bus donation ensures that students in the bus driving course receive the hands-on training they need to be successful. It also helps fill an employment need. Logan adds that through a long-time partnership with TSTC, he has witnessed the college produce high-caliber drivers and employees. The Bureau of Labor Statistics predicts a steady job growth in the bus driving industry, growing six percent from 2016 to 2026. This is on par with the average for all occupations. Also, data shows that Texas has a demand for drivers, employing more than 12,000. TSTC’s Professional Bus Driving Training will be hosted monthly. For more information or to apply, call 956-364-4503 or visit tstc.edu/workforce/ce.